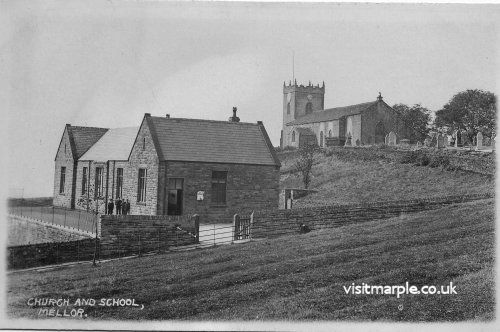 The former Mellor School, now the Parish Centre, with Mellor Church in background. When I was about three my father got to know the Wilson family who lived at the stone- built detached house just up Gibb Lane which in later years we were to occupy. They had a son my age called Norman and it was arranged that I should play with him. Permission was granted for me to run across the meadow when the grass wasn’t long and enter their back garden by a hole in the hedge. This, my first friendship, was to last until we were eleven years’ old. 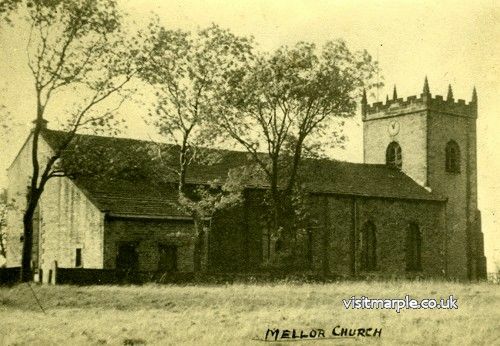 I started at Mellor School below the Church when I was five. To keep the boy infants away from the big rough farm lads, of up to fourteen years old, who all wore clogs; they had to use the girls’ playground. 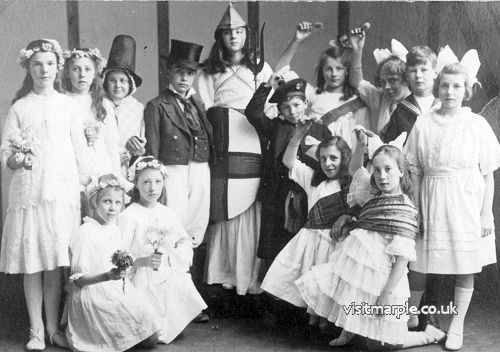 I found this a bit scaring as some of the girls were also big and rough and wore clogs. Most of the games they played, and expected us to join in, were completely bewildering. Mellor School pupils on Parents Day - that is Tom Oldham in the Top Hat. Happily, the classroom was a quiet and orderly place. I can remember some features of that room quite clearly, a counting frame with coloured balls on wires and handwriting copy books and slates. The children, who walked some distance from outlying farms, would bring their dinners, generally basins of meat and potato stew, carried to school in small baskets or bags. There was a fireplace in one corner of the infant room and food and drinks were stood around it later in the morning to heat up. An event to be remembered was a cork blowing out of a drink bottle with a loud bang. After a year or so I was in the next class and in the big boys’ playground. This was a dangerous location, for the games played there were rougher than rugby football. Most of the lads wore clogs with clog irons and brass toecaps so I kept well away from the mad games of football played between the walls of the small playground. In the summer, of course it was cricket, with wickets chalked on a wall and a hard ball called a “corkie”. Marbles was also a summer game, played on the bumpy surface of the playground and the marble players would suffer hurt as well as the cricketers from the hard ball as it ricocheted around. A strip of rough grass covered ground between the school and the graveyard was called the school garden and we could climb up a wall and play there. Along side the road there were some good trees and a telephone pole for climbing. This plot of ground is now built over with school extensions. I think I had only two years in the top classroom in which the Head teacher, Mrs Bartlet, dealt with about five age groups. Here I enjoyed the geography lessons most and the text books were illustrated with scenes from strange lands. There was a large map of the world on the wall with about half of it coloured red to denote the extent of the British Empire. How lucky we thought we were to own so much of the world. Alas for later disillusionment! It was in my last year that I was involved, much against my wishes, in these two parent day events. I am sure we were well educated and I don’t remember anyone who could not read or write before entering the top class room. Discipline was strict, as was the custom in those days, and a cane always lay on Mrs Bartlet’s desk. I only saw it used about two or three times and usually it was punishment for some really bad behaviour. 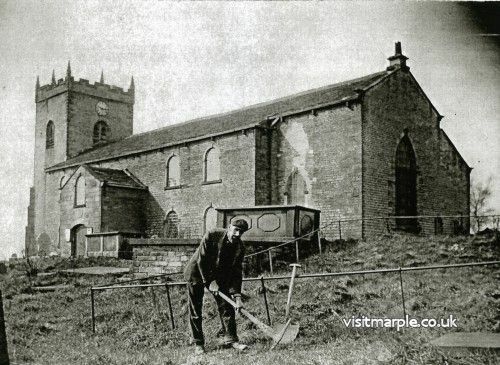 Mellor Church c1900 with the gallery windows still in place. The metal railings mark the site of the old school. During these years my playmates were Norman Wilson, his brother Eric, and several others whose names I have forgotten. The whole neighbourhood within about a mile from our home was our playground. A dense conifer plantation on the hill above Gibb Lane was a favourite haunt. It was private but this did not worry us. We made trails and dens in the thick undergrowth of gorse and brambles and got to know our way about perfectly. Robin Hood and red Indians were our usual games and a nearby group of willow trees provided material for bows and arrows which were essential for these activities. An attempt was made to chase us out but, much to our delight, the man who came after us sank over his boot tops in some swampy ground and we easily made our getaway before he struggled out. On one visit to the wood we found a nest containing nine hens’ eggs which we divided up and proudly carried home in our caps to present to our mums. Unfortunately Eric broke an egg in his cap, saturating the lining with a yellow mess, and his mother wasn’t happy with the gift. We seemed to get snow every winter, often really big falls such as these. We had a good toboggan run down the field below Birchenough Farm but went onto a better run down the hill on the Mill Brow side of the church. This was referred to locally as “Fearless Brew.” We didn’t realise until much later that this was the dialect for the Alehouse Brow. Up to the late 1800’s there had been an alehouse near the church first, what is now the old vicarage and then in a building on the site of the present vicarage. The name was still in common use and can still sometimes be heard although now there is no alehouse. Also in the valley near Moor End was an old mill-pond, much used for sliding on when frozen. It was called Jessie’s dam and people thought that a woman called Jessie might have drowned in it, but we found out later that an early cotton mill owner, called Jessie Brierley, had a mill hereabouts and this was his millpond. He had died in 1853 but the name still lived on.